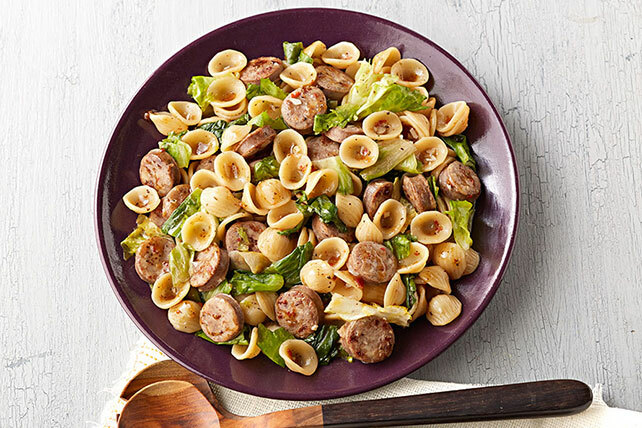 This super-flavorful 5-Ingredient Sausage and Escarole Pasta was made possible by two very robust flavors: chicken sausage and garlic. Cook sausage in large nonstick skillet on medium heat 5 to 7 min. or until evenly browned and heated through, stirring frequently and adding garlic for the last minute. Add pasta, reserved cooking water, escarole and dressing; mix well. Cook 1 to 2 min. or pasta mixture is heated through and escarole just begins to wilt, stirring frequently. Prepare using medium pasta shells. You will need about 1/2 bunch escarole to get the 4 cups chopped escarole needed to prepare this recipe. Follow the package directions to ensure that enough water is used for cooking the pasta. Add the pasta to the boiling water and cook until al dente (tender but still a little firm to the bite), stirring frequently. To prevent pasta from sticking, add it slowly to plenty of boiling water and stir frequently while cooking. Adding oil to the cooking water is not recommended because some sauces may not cling to pasta coated with oil.